The discussions in chapters 2-4 are salient to many aspects of sea-i ce thermodynamics. Brine content influences the thermal properties of sea ice, relative to freshwater ice, but temperature evolution and ice thickness are still broadly governed by vertical diffusion. Heat advection from percolation of brine and meltwater can also be significant. Similar to lake ice, heavy snow cover on a thin platform of sea ice can submerge the ice, causing flooding that creates "snow ice." Freezing of seawater in these conditions is fundamentally different from basal ice accretion, and it can lead to high levels of salt entrainment. This process is particularly strong in Antarctica, due to pack ice divergence that creates a relatively thin ice cover that is vulnerable to submergence. The crystal structure and radiative properties of snow ice differ from those of accretion ice. Snow ice also has a high thermal conductivity relative to snow, promoting sea-ice growth. Ocean heat flux, Qw, is also more variable and potent than the geothermal heat flux into the base of terrestrial ice masses or the basal heat fluxes normally experienced by freshwater ice. Typical values are 1-2 W m-2 but can be higher where warm water masses (e.g., 0°C or even a few degrees Celsius) penetrate to high latitudes. This is known to transpire in the Northern Hemisphere through intermittent forays of North Atlantic water into the Arctic basin. Eddies from the Antarctic Circumpolar current also deliver warm water to coastal Antarctica. Warm water can upwell buoyantly or through Ekman divergence, delivering large heat fluxes to sea ice. A water mass of this type is found in the Southern Ocean and is called circumpolar deep water. This warm, salty water has its origins in the North Atlantic overturning circulation. where ci and Lf are the specific heat capacity and latent heat of fusion of freshwater ice, S is in parts per thousand, and T is in degrees Celsius. The coefficientm comes from the linear approximation to the effects of salinity on melting-point depression: Tm = — m S.
This is equivalent to the enthalpy per unit volume of the ice. These equations are stable because T < 0°C for saline ice. For freshwater ice, the energy of melt is Em =pi [ci (Tm - T) + Lf]. where Qin and Qout refer to the upward-directed vertical heat flux into and away from the ocean-ice interface. Qin is equal to the ocean heat flux, and Qout is the heat conducted upward into the sea ice. 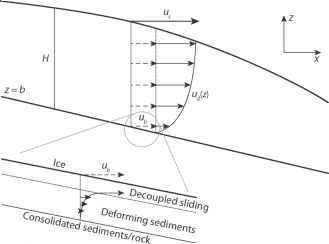 This equation is combined with the surface energy balance at the upper boundary (the snow/ice-atmosphere interface), as described in chapter 3, and the conservation of enthalpy within the ice volume. Substituting enthalpy for internal energy (temperature) in Eq. (3.5), the thermodynamic evolution of sea ice follows where J accounts for solar radiative heating and latent energy release/consumption from internal refreezing/ melting. A term can also be added to account for heat advection from brine percolation, given a model of that process. To define fully sea-ice thermodynamics, salinity evolution S (z,t) also needs to be accounted for. Along with (5.4) and (5.5), this gives a system of coupled equations for the temporal evolution of sea ice of thickness H, with vertical temperature and salinity structure T (z) and S (z). Similar to the heat advection associated with brine migration, this is difficult to measure or model. At present, most sea-ice models prescribe salinity or hold it fixed.